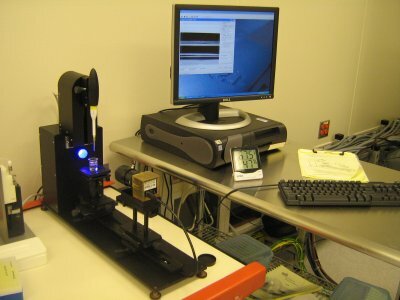 The goniometer KSV CAM200 measures surface and interfacial tension, static and dynamic contact angles, surface free energy of solids, and meniscus contact angles with a computer interface. The goniometer is kept on a floating table to minimize measurement errors. An automated dispenser with disposable tips can be used for different test liquids. A high speed camera is used to capture the drop shape throughout the entire process. The frame interval can be set from 10ms-1000s. The contact angle measuring range is ~4-180° with an accuracy of ±1°. Dispensing in liquid environments can be performed with a transparent vessel, where a fluid different than air is used as the reference environment. The software performs curve fitting image analysis to determine contact angle measurements. The fitting methods available are Bashforth/Adams for pendant drop, circle and polynomial for contact angle experiments, and Young/Laplace can be used for all experiments. Data and images can be exported for further analysis. The software has a database of many common materials and liquids.